40 foot containers offer a lot of space! These units come in a variety of options with endless possibilities for customization. They are also available in “high cube” models which feature an extra foot of overhead space, perfect for use with forklifts. Many of our customers use them like billboards, adding their logos, phone numbers, and website address. 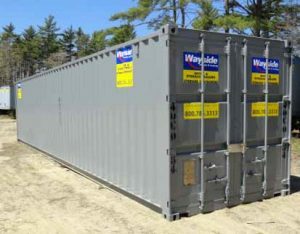 Our containers are available for purchase and for rent!